Opening Sentences: It is the hour of the Snake, a time of day when the sun works hard to warm the earth. The black cockerel with the all-knowing eye struts, haunting the execution ground as he always does, and Lao Guzi is wondering what he always wonders: Is the man guilty? Synopsis: A timeless novel of one woman who bridged two worlds in a tumultuous era of East meets West. The Courtesan is an astonishing tale inspired by the real life of a woman who lived and loved in the extraordinary twilight decades of the Qing dynasty. To this day, Sai Jinhua is a legend in her native land of China, and this is her story, told the way it might have been. The year is 1881. Seven-year-old Jinhua is left an orphan, alone and unprotected after her mandarin father’s summary execution for the crime of speaking the truth. For seven silver coins, she is sold to a brothel-keeper and subjected to the worst of human nature. Will the private ritual that is her father’s legacy and the wise friendship of the crippled brothel maid be enough to sustain her? When an elegant but troubled scholar takes Jinhua as his concubine, she enters the close world of his jealous first wife. Yet it is Jinhua who accompanies him--as Emissary to the foreign devil nations of Prussia, Austro-Hungary, and Russia--on an exotic journey to Vienna. As he struggles to play his part in China's early, blundering diplomatic engagement with the western world, Jinhua’s eyes and heart are opened to the irresistible possibilities of a place that is mesmerizing and strange, where she will struggle against the constraints of tradition and her husband’s authority and seek to find “Great Love.” Sai Jinhua is an altered woman when she returns to a changed and changing China, where a dangerous clash of cultures pits East against West. The moment arrives when Jinhua’s western sympathies will threaten not only her own survival, but the survival of those who are most dear to her. 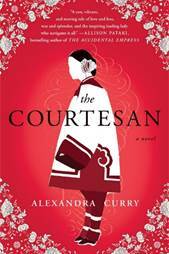 A book that shines a small light on the large history of China’s relationship with the West, The Courtesan is a novel that distills, with the economy of a poem, a woman’s journey of untold miles to discern what is real and abiding. The exotic setting of old China has always fascinated me. This novel is set in the Qing Dynasty of the 1880's and opens with the execution of 7 year old Sai Jinhua's father. Her mother was a concubine who died in childbirth. Her father remarried, but he has been executed for political reasons. Unwanted, Jinhua's stepmother sells her to a brothel where she will live until she is old enough to begin work as a prostitute. The life there is very harsh and Sai Jinhau is subjected to having her feet bound. At twelve, Sai Jinhua loses her innocence and joins the other prostitues in their work. The novel follows her life and her rise when she is sold to Hong, a Chinese Diplomat who is beguiled by her resemblance to his first wife who committed suicide. Together, they travel to Vienna where Jinhua is a novelty. There, she experiences freedom and knowledge and gains self-confidence. But Hong dislikes her newfound strength and empowermentis and more and more he keeps her locked away from society. Nicely researched, I thought the complexities of the Qing Dynasty were aptly described. The early life of this poor orphan who faced such horrendous circumstances was fascinating. I found the first half of the book unputdownable, and the pace slowed a bit thereafter, and I became a bit detached from the story. Some of the magic was lost, but the story still held my interest enough to get to the ending. A nice novel that swept me into a time and a world of long ago. A fascinating woman of history indeed!